Searching for the best wood lathe for beginners? There is a lot of wood lathe machine available on the market. Which one you should you buy can confuse you. A wood lathe is used to make wood DIY. To make the wood DIY more beautiful you just need to use a wood lathe. It is a very tough job to choose the best wood lathe tools for your workshop. This article regarding best wood lathe chuck will help you out to choose the right one for you. Here you will find various lathe machines review. I will recommend you in this article about your wood project which brings best wood lathe for the money. In General, a lathe machine has very high speed and it holds the workpiece tightly. It gives the motion to the workpiece too. So, you can give a circular shape to your workpiece. Here your workpiece will be the pieces of wood. For a wood piece, you will take a wood lathe machine. Want to make round furniture for your house? Or want to make a round or any round shape wood project? 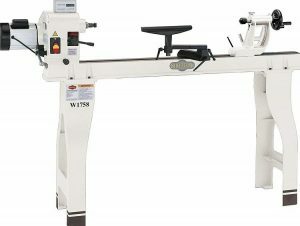 Here it is, the WEN 3420 Benchtop Wood Lathe. It will save your time. It has variable speed and the speed is 750 to 3200 rpm. The speed variation will help most to gain the perfect shape. The headstock gives the exact motion you want to have and the tailstock holds the workpiece tightly. 2 ampere of a motor gives circular motion to the wood piece. The Flat wrenches, a center spur in the headstock and cup center in tailstock are also included in the machine. 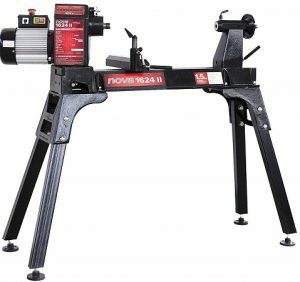 It has also 7-inch tool rest and overall weight for this product is 44.1 lbs. The product dimensions are 26 x 10 x 12 inch. You can only cut the wood and give shape through this machine. You can turn your wood piece shape near to a pen shape and can generate smooth speed. This lathe has a solid construction and also the best for the beginners. The weight is light enough and you can slow it when your need is over. This is safer for the starter operator. It is not suitable for horizontal drilling. A wood lathe machine turns your wood piece into a certain shape. It has given more control over your wood project indeed. The SHOP FOX W1704 Benchtop Lathe machine is one of them which has 2 ampere motor with 110 volts power supply. The maximum distance between the centers is 12 inch. This is constructed by casted iron. The coolest features for this is that it has a variable speed control for infinite range from 700 to 3200 rpm. This variation helps to manage soft and hardwood piece. It has an amazing look. Total weight for this product is 50.8 lbs. The product dimension for this product is 7.1 x 27.9 x 13.7 inch. It has also a secured bench and you can use it at your home or workshop. The headstock and tailstock work perfectly. It has excellent durability. The smooth surface helps to shape the wood piece very well. The live center works for a long time period and it works very fine. To Make totally less noise which is comfortable to work with it. Everything related to this machine is very easy to operate. A beginner will have many advantages for this. While working can be glide smoothly and sometimes the motor can be burnt. To put both axes of a wood piece in the machine’s cylindrical part is the way to shape your wood. I have represented another machine for you is Delta Industrial 46-460 Midi Lathe. It has up to 1,725 rpm motor speed. It has three individual pulleys to change the speed as you like. That’s why you don’t have to change the belt to change the motion or speed by your need. To achieve uniform finishing the forward and reversing facts affects much to your workpiece. 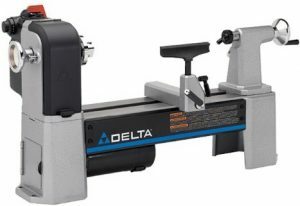 It has MT 2 on both the tailstock and drive spindle and also indexing features too and very easy to use. Total weight for this machine is 97 pounds. The product dimensions are 36 x 11 x 17.8 inch. It does not require any battery and has 5 years of warranty. One thing you must know that delta company is not much concern about their customer services. You can change the speed as you like. It can gain super speed. You may have found wobble in the headstock. The speed variation can be damaged after using several days. Here it is with the benefit of swivel head which is 360 degrees rotatable. Where you can find a motor of 1.5HP (horsepower) ac motor connected and also stood to hold the machine upright the land. The iron used on it is fully cast iron. Swing capacity is 16 inch. The speed varies from 215 to 3600 rpm. It is the best wood lathe for turning bowls. It is versatile enough to give excellent spinning and It contains the 2MT live center. Great speed range is available. Nova Company has brought this to the market for the beginners as it is very easy to use. It has 5 years of warranty for the parts and 2 years for the motor. Total weight is 273lbs. The dimensions are 43 x 11 x 19 inch. The measurement system for this machine is the Metric system. It looks very fashionable. It has great speed variance and it works very well. Swivel head gives the opportunity to rotate it 360 degrees. The stand which is included with it helps to carry the machine body. Very easy to install and operate. It is specially built for the beginners. It has very high weight and not easy to transport. 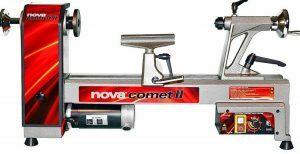 I have represented another wood lathe machine brought for you by the Company NOVA. Nova 46300 Comet has exactly the same feature as the other one described before. Speed varies from 250 to 4000 rpm. This lathe has a very high speed. This machine has 3 steps pulley system installed to speed it up or down easily. The electric motor that is included into it is 3 or 4 HP. It is the best in the market. It works very well to shape your wood piece. It also has excellent durability. It has on and off switch that works very fast and save your time. Easy to install and use and also strong structured. The bed can be extended for the larger project. The lathe also has a grinding wheel to change the gear. Overall weight is 82.4 lbs. The dimensions are 33 x 9 x 18 inch. Only 1 year of warranty. It has lightweight you can bear it anywhere and fit it any place. The speed is very high that helps to create the wood project easily. After some days of using the motor can be stopped. A wood lathe is used to complete the wood project. It helps to shape your wood piece. You can do this both metal and wood lathe machine. But to me the wood lathe machine too much preferable. 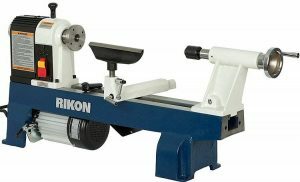 Another wood lathe machine isRIKON 70-100 Mini Lathe. It has a very easy entrance to the speed change. To remove the center you need not use the knock out bar. This has a ram which is laser engraved. It has the ability to add one or more external motor with 1/2HP. It is the largest mini wood lathe in the industry. You can find this on amazon wood lathe zone. For detail work, it has an indexing head. The speed can be changed too quickly and easily. The feature of self-ejecting tailstock is very amazing. It helps to saves time. The machine is user-friendly and very easy to operate. Total weight is 91.4 lbs. The dimensions for this product are 33.8 x 18 x 11.5 inch. It has 5 years of warranty. Lightweight and very fashionable to look. The lathe is very big in size and gives you the chance to shape the large wood piece. The speed can be changed by changing the pulley. You may find sometimes turning bug while shaping the wood into pen size. You can find here another best lathe machine from Sop Fox. The model number is W1758. It has fully cast iron legs and digital readout. The motor is of 110 volts with 2 HP. It has a lever to adjust the speed. The speed range for this product is 600 to 2400 rpm. Quick release lever feature is included. This feature helps to rotate the headstock in several angles. This lathe has 6 inches of the faceplate included in this machine and It has also a MT 2 spur center mechanism. It is swivel arm based. 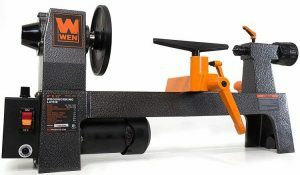 It is the best affordable wood lathe on the market. It has tool rest facility too with extension. The larger wood project can also be done by this machine. It is highly durable and has good speed. Total weight is 301 lbs. extremely high weight than the others. The dimensions are 64 x 18 x 16 inch. It has 2 years of warranty. It has enough power to turn your workpiece into anything you want. The change of speed is very easy to control. It is very easy to manually line the workpiece up when tightening. Does not have a reverse function. So it can’t be reversed while working in it. The lathe has a very high weight. Positive locking positions are available in 7 different directions. It comes with the newest feature. It looks very smart and fashionable. It is easy to use. The headstock and tailstock work so well that I can happily say that it would be the best in the market. The speed varies from 400 to 3000 rpm. It has such a great speed to generate. It has a display and it’s very easy to read. The tailstock has an anti-rotational key. In spite of having the high weight, it is much preferred due to its quality. 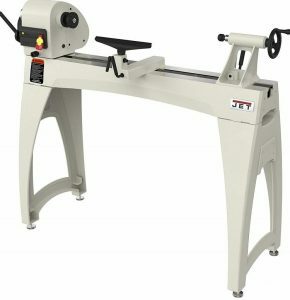 The weight for Jet JWL-1440VSK Wood Lathe is 400 lbs. and the dimensions are 87 x 57 x 38 inch. It has such a big body. It does not have a reverse function. It has plenty of power. It is very much attractive to the woodcraft lovers. It has 5 years of warranty. It has a speed range with 3 variations. A quick change belt helps to change the tension lever. The frame is made of casted iron. The tailstock in it is very smooth while turning. Spindle thread is of 1 inch and the machine has speed display. The display is digital. It has fashionable look. It is also very easy to operate. Durability is extremely good. While turning bowl blanks there happens no vibration at all. The headstock is swivel. The bigger project can easily do by this machine. It looks very nice with various features and includes a setting named CA has good friction. This lathe does not make any sound or noise while working and also has good speed control along with good design and construction. That’s the reasons this lathe is very pleasant to use. This has two-bed extensions and a stand which is a metal build. Total weight is 144 lbs. The dimensions are 36 x 19.5 x 17 inch. It has 2 years of warranty. For the woodcraft lover, a wood lathe machine is very familiar. 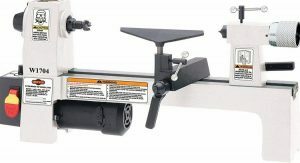 Another wood lathe machine named PSI Woodworking TCLC10VS Midi Lathe is on sale. It has excellent speed variation. The speed varies from 150 to 4100 rpm. It can generate very high speed indeed. It has microprocessor technology included which is capable to control the machine perfectly. Spindle locking with 24 index positions is a nice feature. It also has a tool rack to keep the tools near to the hand. The motor provides a good power supply to run the lathe machine. The motor is of 3/4 HP. It provides an extended bed for the workpiece. You can easily shape your wood piece with turning your project up to 43 inches. It is very easy to use and designed for easy entrance for the belt. It is suitable for the beginners. It has the warranty of 3 years. Total weight for this product is 89.5 lbs. Product dimensions are 40 x19 x 14 inch. It has a very high speed. After a certain period the motor can be stopped. Are you confused to choose the Best Wood Lathe for Beginners? You love to do woodcraft and want to give your wood piece a beautiful round shape. Then you definitely need the best lathe machine for this. 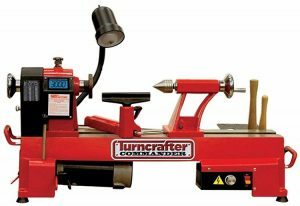 The best home lathe can help you to make your dream project with wood. Wood lathe for pen turning is the best project so far I think with a wood lathe. So, you have decided to buy a wood lathe machine for your workshop. But before buying you need to know many things about a wood lathe machine. Here I will discuss more the facts that you should know before buying a wood lathe. Hope this will help you to choose the wood lathe machine. One has to be very concern about motor speed. Need to know about motor rpm. Maximum speed generated by the motor should be known to the operator. You should also know for what types of shape what rpm of the motor is needed. Then the motor quality has also some facts regarding choose the best wood lathe for the beginners. The best quality motor can give you the best feedback. So, before buying you should obviously know about the motor specification very well. The head stock of a wood lathe machine rotates in a circular speed. And the tail stock holds your object tightly. Many machines have a different rotational angle. You have to know about the angle and utilize them to get the perfect desired shape for your wood piece. The chuck in the head stock can rotate in the different angle. Safety should be the first issue while working. We all should give the first priority to safety issues. The machine has such a good speed that can cause an accident. So stay protective. For noise, you can use earplug to protect your ear. Always try to keep a safe distance from the spinning edge. Remember the lathe have blade in head sometime for projects demand so be careful about it. As wood lathe is a machine you have to maintain it regularly. Keep the surface neat and clean after finishing a project. The nuts can be affected by rust. So you have to check the joint and clean them once in a month. In your projects you have to need dust collector for cleaning your work shop and the machine as well. You can also use lubricant to lubricate the machine’s parts. Though warranty is the fact to your machine the lasting of a machine depends on you. It’s totally up to you. If you use it recklessly as your mind desire then it can be damaged. Moreover, the motor can stop working due to much pressure on it. Yet warranty does have a fact. Check your warranty for your wood lathe machine before buying. And one more thing that you have to be concerned about the customer service center availability. All the machines can’t be transported anywhere due to high weight. Heavy parts are not suitable enough to bear. Keep your eyes on if you want to finish your work at different places. If the weight is too high then you can’t bear it easily. For a woodcraft lover, a wood lathe machine is very important. If you want to finish a project of wood then you need to use a wood lathe machine. It will give you the opportunity to shape your object round. Those who are the beginners this portion is especially for them. First of all, you should know very well about a wood lathe machine and also you have to budget as well for your projects.The machines have different parts. You should also check the power supply source to run the machine. In this section, I will discuss some major facts by categorizing them. Basically, there is only one type of wood lathe machine available in the market. Just the various companies have various designs. Mainly a lathe machine is used for shaping your objects. And a wood lathe is used only for wood. A wood lathe is a very much speed oriented. The speed is different and varies from machine to machine. A high speedy machine can do the job in a short time where others need a little more time to finish. It is a machine of rotating sharpen object. It rotates the object and you can easily give a round shape to your object. For beginner woodworkers, it may be mentioned that only practice for a long time can make you professional at this. By being professional you can give a perfectly round shape to your wood piece. It is the most important part for the beginners as I think. 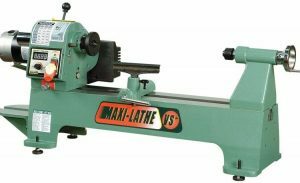 An expert knows which machine is the best lathe machine depending on its material. As a beginner, you should also know the types of material of your chosen lathe machine. There is a different kind of material lathe machine available on the market. You should pick the one which you think it will lust more. There are different designed wood lathe machine in the market. They have different sizes. They have different dimensions. For a suitable dimension, the length should be 60-70 inch. The width should be 18-23 inch and the height should be 12-18 inch. You can work perfectly with a suitably sized lathe machine at ease. So, size can be an issue for choosing the right lathe machine for your workshop. Choose your wood lathe according to the size that fits for your comfort. You should obviously know how to set a wood piece into a lath machine. So you can check that what diameter is the capacity of your lathe machine. You can also go through the instruction manual and view some videos over lathe machine. The fact is you have owned a lathe machine for woodworking. You are now confused where you will keep the machine. My suggestion will be to keep your wood lathe near to the power supply source and in a corner of your workshop. If you are not working with it then cover it with coverage. At the end of the review, I hope that you have found the best wood lathe for your workshop. Before buying check the details and know about the pros and cons of a machine. You should not buy a product without knowing it very well. If you do so then there will be no way to recover the wasted time. All lathe machines described above is the best in the market. But not all of them are suitable for your workshop. First, think about where to place the machine then buy. Don’t be hesitated to buy your one. If you think that you need that then buy it. Click to buy your one. Happy shopping.